Recently we have been tasked to make our own design process so that we can check which each piece of work we create that we are following our own design process or skipping steps, it also allows us to evaluate how we are working at the moment to make some tweaks and adapt it to the most effective workflow for our own work. 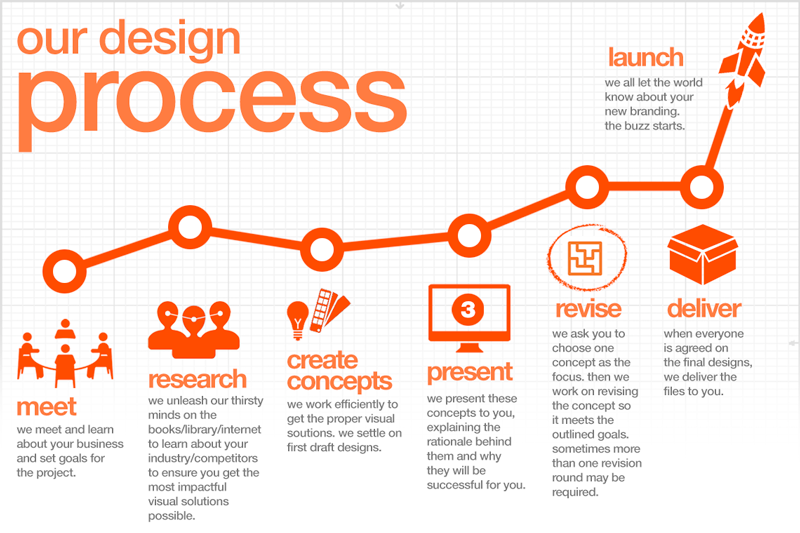 First I did some research on design processes to give me an idea on roughly the general pattern of a creatives process. The easiest place to start was with my tutors, as professionals there design process has been tried and tested many times to be fine tuned to what worked best for them. Paul here has has subdivided his process into 4 sections based on percentage to outline where the majority of work should go which is the early stages of brief, research and concept. It has a modern sharp look to it, i particularity like the circle getting bigger as the process gets further on to indicate progress, almost like a loading bar. This is my tutor Gareth Sleightholme’s design process. This is a very visual style design process using arrows and using colour to highlight key areas. As you can see this is a scan of his paper pad which would now be ready to enter the next step of Photoshop if he wanted to but there is no need as your personal design process should be something you understand and as long as you can follow it each time you have a working design process. Then from Gareth’s blog i followed this link to Domanic Li’s design process another tutor here, so clearly it is widely regarded as a thing each creative should have and follow to increase quality of work. This process is extremely helpful as it outlines each area in a detailed ranged way so that it can apply to many areas of art and design. Other examples i collected are just different examples and ways of design to explain a design process. This design process is from Dezigngeek. I like this design as its quite visual and with the rocket its as if you must take all these steps as you would checking a rocket before blast off. Simple but the visual aid from the pictures make it more attracting. This design process briefly shows the steps to take but rather focuses on your certainty on your project, the scribbles indicate you are up in the air with ideas and have nothing pinned down but if you complete the steps you gain more clarity in your work. I really like how this has been portrayed as this indicates if you go straight to the final product your missing something and may run into issues due to lack of a followed design process. 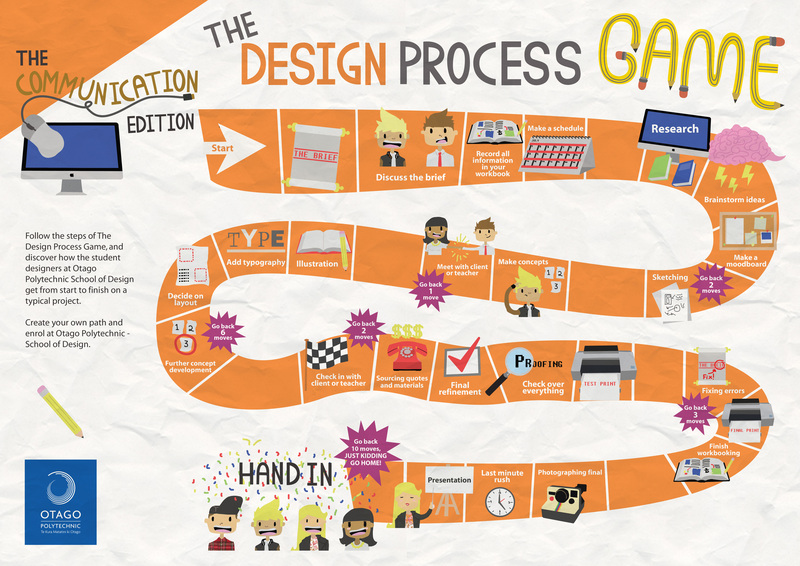 Then finally this is a design process gamified which ties into our gamification work, but nice visuals and a cartoon style to it could teach younger people to implement a design process into their work at a earlier stage or at least consider what theirs might be. Regardless of that it is still relatable to adults as they annotate certain things with teacher/client so its applicable to all people. This has much more steps than most design processes i have seen but some are generally slotted into one overall category like “design” for sketches, concepts, iterations etc. Now i have to create my own which will apply to my work no matter 5 minutes or 5 weeks, client or personal. 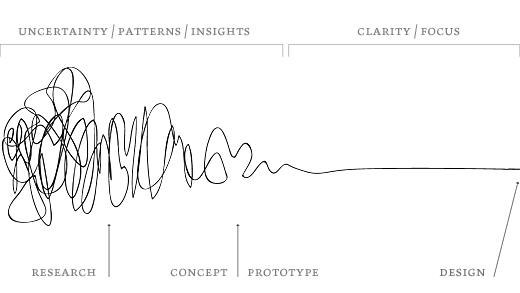 A design process should be adaptable to the time deadline set to produce the best outcome of work. Categories: Client Project, Game Theory, Gamification, Self initiated, Year 2 | Tags: Adobe Photoshop, art, Design, Design Process, progress, research, visual art | Permalink. Following on from last weeks session we asked the group inidvidually what area of work they would like to be in for the rest of the cleint project. As explained last session this is purely to try maximise workflow getting people to work in the area they want to go into industry with for the majority with other areas on the side. This group session really felt like we had all clicked and finally collaborated to try maximise the potential of the project. 3d team is myself, Viktor, Brad and Rinalds with myself as leader. Art team is James (wolfy), Barrie and Abbie with James as leader. 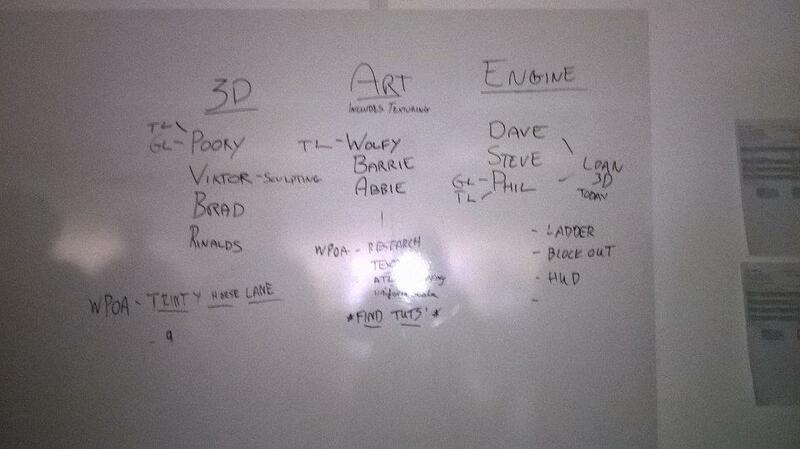 Engine team is Phil, David and Steve with Phil as leader. Steve, Viktor and Brad was absent for this session so as leaders we placed them into the teams that we felt they are most effective in and want to do in future. We then sat down and discussed the plan of action (POA abbreviated) for each of the teams and how we would collaborate between teams. For my 3D team we set a target of a street a week, this maybe rather high expectations but until we test if we can meet this deadline we wont know also placing this deadline will push us as a team to focus and improved speed of work. I personally think a week is a good target dependent on the skill and difficulty of the buildings but 2 weeks should be the limit if we are to push on. The art team we all sat down including myself and Phil as we are overall team leaders to have final decisions on work. We discussed the art team and their collaboration with the engine team, there priority is to upskill in texturing and uv mapping to work with the 3d buildings handed over. Then to produce basic, slightly visual and then some high quality (public viewed) concepts. The engine team just need the basic concepts where its simple boxes labelled car or building etc with some annotations of angles and maybe movement mechanics. This will assist them with the engine block out and add to our design work rather than first decision of put that there it will do. James is inevitably leader of the art team and will have to pass on some skills to his co workers to produce quality for this process. Im sure more has been added to this plan of action i believe the production of atlas mapping has been worked on over the day. Then the engine team currently has HUD to work on, additional blueprints that could be implemented for interactivity (e.g. ladder climb) and then the rest is working on the block out with relies on the 3d and art team to collaborate with them. I think we have formulated a effective team workflow with a good balance to it for everyone to have equal input. Hopefully this goes as well as we plan it to as this goes towards credit for our professionalism and industry practice marks. For today we borrowed Phil and David from the engine team as currently they have little to do and 3D is a priority so loaning them to 3D was a way of showing we are all team players if needs we interchangable team positions to accelerate the process will occur. 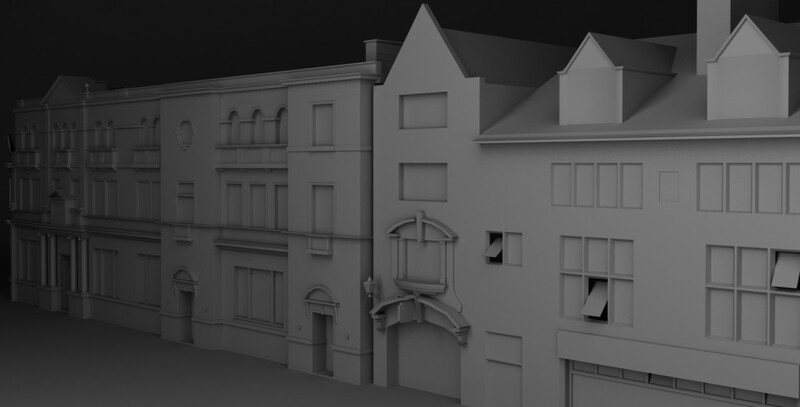 As 3D team leader i tasked my group to Trinity House Lane, myself and rinalds picked 3 buildings and Phil and David picked 1. Leaving a few for Viktor and Brad when they return, the lists are up on Basecamp and they are yet to claim buildings and i havent seen them so hopefully they are in tuesday to catch up. Currently i am working on weatherspoons up to Bob carvers they are my 3 buildings all connected so should be no issues. Throughout the day teams sat with their teams worked together and it just felt like we had missed a trick not doing this from the start, lots of peer to peer learning and group/team critique will come from this our communication has definately improved and has been underlined as key for this to succeed. On a final note we have decided to implement the Oculus Rift into our project which will hopefully attract alot of attention when we finally display to the public. Categories: Client Project | Tags: 1960s, 3D, Brief, Client, Design, Design Process, progress, Project, Team | Permalink.